The 2014 Eastern Conference Finals are set, and it’s an Original Six match-up that not many predicted at the beginning of the playoffs. For the first time since 1996, the New York Rangers and Montreal Canadiens are meeting in the Stanley Cup playoffs (the Rangers won that first round series 4-2 after losing the first two games, in case you were curious). The Rangers, who were the second seed in the Metropolitan Division, took out the third seeded Flyers and the division champion Penguins – both in seven games. The third seeded Canadiens out of the Atlantic Division swept the second seed Tampa Bay Lightning, and then eliminated the division champion Bruins in seven games. If you were to rank the East by points, the Conference Finals features the third best record (Montreal) against the fifth best record (New York). -Cam Talbot’s shutout in the 11/16/13 victory was the first Rangers shutout in Montreal since Ed Giacomin helped the Rangers to a 5-0 victory on 2/25/67. Things change in the playoffs, but trends and recent numbers and stats shouldn’t be completely ignored either. 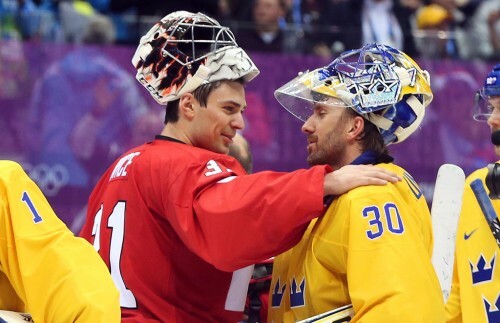 Carey Price and Henrik Lundqvist shake hands after Canada won gold at the 2014 Sochi Olympics. This meeting will determine who goes on to play for the Stanley Cup. The match-up between the pipes is a rematch of the 2014 Olympic Gold Medal Game. Carey Price manned the crease in Canada’s 3-0 shutout of Henrik Lundqvist and Team Sweden. Both goalies played big in the second round for their respective teams, and you could make the argument that both netminders are the reason their teams have gotten this far. Price is 8-5-1 against the Rangers in career, including five shutout victories, with a .934 save percentage and 2.06 GAA. As for Lundqvist, he’s 13-11-2 (one shutout), with a .897 save percentage and a 2.85 GAA. His numbers at the Bell Centre are less impressive: 4-5-2, .876 save percentage, a 3.87 GAA, and he hasn’t won there since 3/17/09 (and hasn’t played there 1/15/12). Heading in to this series, both goalies are playing very well, so creating confusion in front of the net is going to play a huge part in having success on the scoreboard for both squads. As for the skaters, the conversation has to start with Montreal Defenseman PK Subban. He’s tallied four goals and eight assists, which leads the team in playoff scoring and currently ranks sixth in the NHL (heading in to Game 7 of Anaheim–Los Angeles). He’s been outright dominant in both ends of the rink during the 2014 playoffs. During the regular season, Subban had ten goals and 43 assists, which ranked second in team scoring (behind Max Pacioretty). 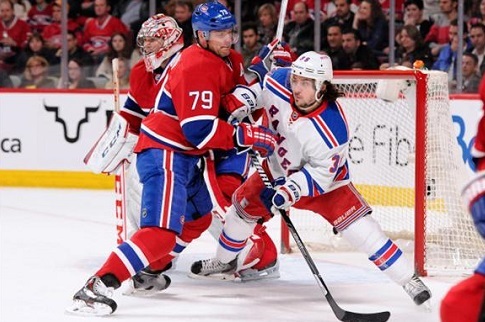 Subban isn’t the only Montreal rearguard who is capable of generating offense. Andre Markov has a very hard shot, and tallied seven goals and 36 assists (five assists during the playoffs) during the regular season, with 21 of those points on the power play. Marc Staal and the rest of the Rangers will have to be on top of Canadiens Defenseman PK Subban, who has been Montreal’s best player in the 2014 playoffs. Up front, Montreal boasts a deep group of talented players. LW Mac Pacriotetty led the team in scoring, and fell one goal short of being a forty-goal scorer. They added LW Thomas Vanek at the trade deadline, who currently leads Montreal in playoff goals with five. The Habs are strong down the middle with Lars Eller, Tomas Plekanec, David Desharnais, and grizzled vet Danny Briere. On the right side, Brian Gionta brings plenty of playoff experience (including a Stanley Cup with the Devils in 2003), and Brendan Gallagher plays better than you would expect of a second year-22 year old. What’s intriguing about this series is that both teams are more comfortable in a defensive, low-scoring game. But both teams are capable of turning on the offense if that’s what’s required. The X-factor in this series will be the play of Rick Nash. The Rangers have gotten this far despite the fact that the guy who led the team in goals during the regular season (26) has yet to light the lamp in the postseason (five assists). Chris Kreider has been very noticeable on the ice since his return from a broken hand, and maybe he can draw some attention away from Nash when the Rangers top line is on the ice. Staying out of the penalty box will also be important, considering Montreal is fourth in playoff power play success (10 for 38 – 26.3%). Another storyline to keep an eye on is Martin St. Louis, who grew up in Montreal, and will be playing games there for the first time since the passing of his mother last week. Both teams are coming off of seven game series, and I don’t anticipate this series going less than six games. I’m picking the Rangers in seven, but either team winning in six or seven wouldn’t shock me.